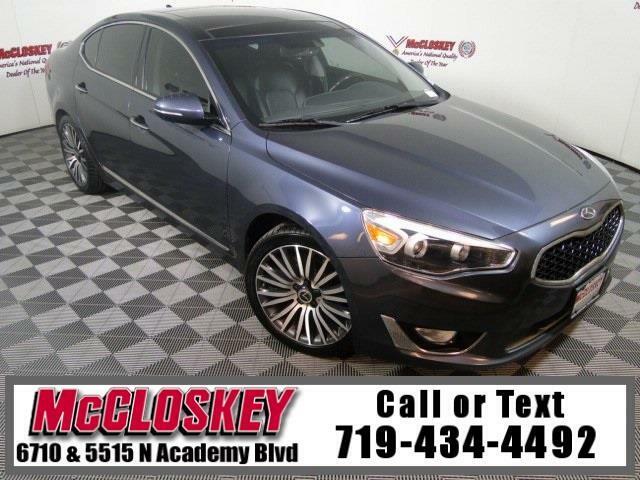 Pamper yourself in this 2014 Kia Cadenza Limited Panoramic Moon Roof, Navigation System, Leather Heated Cooled Seats, Infinity Premium Sound System and Sirius XM Radio! Standard features on the Premium include 18-inch alloy wheels, automatic headlights, foglights, rain-sensing wipers, power-folding sideview mirrors, keyless ignition/entry, dual-zone automatic climate control, an auto-dimming rearview mirror, leather upholstery, a tilt-and-telescoping steering wheel, 10-way power driver seat, four-way power passenger seat, heated front seats and a ventilated driver seat. Standard high-tech features include a rearview camera, rear park assist, an 8-inch touchscreen display, Kia's Uvo voice command system, a navigation system, Bluetooth phone/audio and a 12-speaker Infinity sound system with a CD player, satellite radio and USB/iPod/auxiliary audio inputs. Every Cadenza is fitted with a 3.3-liter V6 generating 293 horsepower and 255 pound-feet of torque. This vehicle passed our 110 multi-point inspection and is backed by our National Quality Dealer of the Year Award. We are an ''A+'' Better Business Bureau Rated Business. We offer low interest rate financing, low down payments and the highest trade allowances in the state! Here at McCloskey we do things a bit differently, we shop our competition every day to ensure a great value to you. Come on down and experience it for yourself. This McCloskey Assured vehicle includes a 2 month/2000 mile Warranty and a Vehicle History Report!! At McCloskey we strive to provide ASSURANCE, TRUST, VALUE AND QUALITY! Call 719-434-4492.